Cinnamon rolls are one of those things in life that just make everything seem ok. A warm, gooey cinnamon roll is comfort food to me. I haven't tried to make them from scratch for 14 years; the last time I did it, I was in home economics class my freshman year of high school. I don't know why I waited so long. I was pretty intimidated, remembering it to be a long, difficult process. However, I was pleasantly surprised; first, because the rolls were pretty easy to make, and second, because they tasted so much better than the ones I had in high school. The addition of cream cheese in the dough made them so moist. 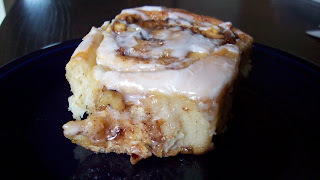 If you haven't made cinnamon rolls before, this is definitely a recipe worth trying. Heat water to 115 degrees and add yeast and 1/2 tsp sugar. Mix and let sit about 10 minutes until foamy. Add remaining 1/4 cup sugar, milk, brown sugar, vanilla, and eggs. Beat with a wire whisk until well combined in a stand mixer. Switch attachment to dough hook and add flour and salt. Mix the dough on medium-high speed for approximately 4 minutes. Add the butter and continue to knead about 6 more minutes. The dough will be sticky. Turn dough out onto a well-floured surface and knead about 1/4-1/3 cup more flour into the dough by hand. Grease a deep bowl and place ball of dough in the bowl, turning once to evenly coat the dough with oil. Cover with plastic wrap and allow to rise until doubled in size (1-2 hours). Shortly before the dough is finished rising, mix the filling. Combine all ingredients in a bowl and stir until moistened and combined. Set aside until dough is ready. Place cream cheese in a small bowl and mix until easily spreadable. Turn dough out onto a well-floured surface again. Knead 1-2 minutes until dough is no longer sticky, adding more flour if necessary. Roll the dough with a floured rolling pin to a 10x10 square. Spread cream cheese gently and evenly over dough. Fold the dough into thirds, like a letter, and then fold the resulting rectangle into thirds again. Turn seam-side down and re-roll dough into a 10x20 rectangle. Melt 2 T. butter and brush over dough. 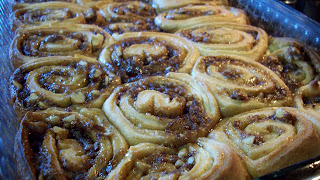 Pour filling onto dough and spread evenly, leaving a 1" border on side you will roll toward, so the roll can be sealed. (Roll from short sides for bigger rolls, recipe will yield about 8 rolls, or long sides for smaller rolls, yields about 15 rolls.) Roll tightly and place seam side down on a cutting board. Using a sharp knife, trim off the uneven ends, and cut the roll into approximately 1 inch thick slices. Grease a 9x13 baking pan and set rolls, cut side up in pan. Cover the pan with plastic wrap and either let rise for 2 hours or refrigerate overnight. Preheat oven to 375 degrees, let rolls sit at room temperature if refrigerated for at least 15 minutes. Bake until tops are golden brown and filling is bubbly, approximately 30 minutes. Melt remaining 2 T butter. Cool approximately 5 minutes and brush tops melted butter. Whisk ingredients together in a small bowl, adding additional milk or sugar as necessary to reach desired consistency. Drizzle onto rolls. 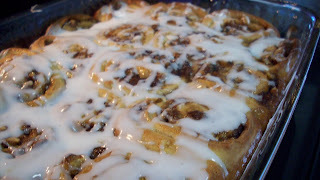 I love making cinnamon rolls on Sunday mornings these look wonderful.